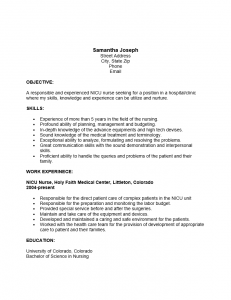 The NICU Nurse Resume Template is a guideline for registered nurses seeking employment in neonatal ICU units. This profession centers itself on newborns possessing significant health risks. This can be due to a variety of conditions ranging from congenital defects to premature births. Babies with such difficulties are sometimes precariously hanging on to life and require very close supervision indeed. NICU nurses will have to do everything from monitor their condition, draw up treatment plans, diagnose problems, and be prepared to act quickly in the event of an emergency. 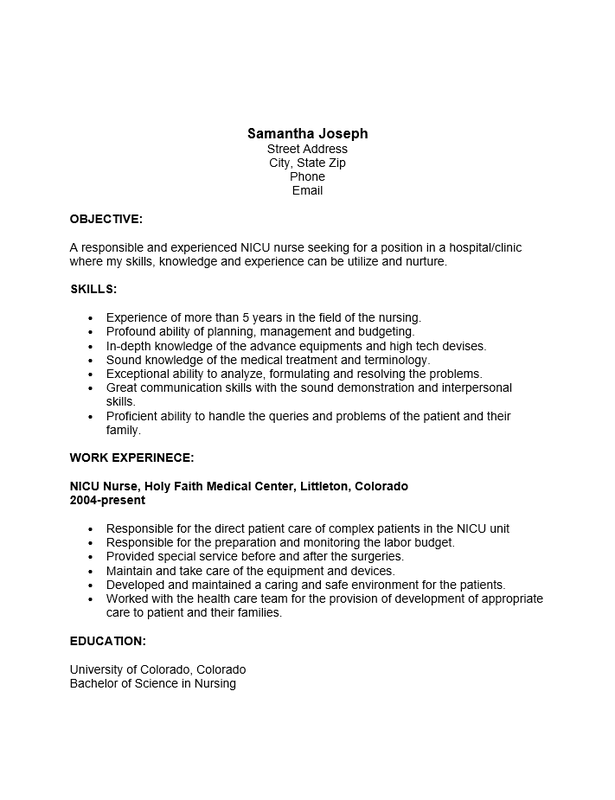 An NICU nurse resume will need to be picture perfect to gain serious attention. It must certainly represent an organized and dedicated professional with a strong knowledge of neonatal medical care as it will be scrutinized very carefully by a recruiter. The headings (Objective, Skills, Work Experience, Education, and References) presented in this template are designed to divide a candidate’s information into logical sections which will aid an employer in determining his or viability for the position being sought. In addition to providing a structure this template seeks to also be physically attractive to a recruiter. This is particularly important as a polished looking resume will attract positive attention from a recruiter. When using this template job seekers should be prepared to be very clear about their capabilities and credentials. After all, while a template may aid in aesthetics and structure, it is the content that will hopefully result in a hiring entity’s call. This will be the first point of contact with a potential employer and thus it is important that a flawless presentation is delivered in order to win an interview. Step 1. Enter your full name and contact information at the top of the resume. Step 2. Write one to three statements regarding the purpose of the resume and/or what would qualify you for the position you are applying to. Step 3. Write a list detailing the skills you possess and experience as it relates to being an NICU nurse. This should support the statements made in the Objective section. Step 4. Report your employment history in the “Work Experience” section. Do this by composing a list of your previous employers and organize them in descending chronological order according to your dates of employment. Each entry should contain the official job title you held, the name of the employer as well as the city and state of the job site, and the dates you worked there. Below this should be a synopsis of the duties you performed there and/or any notoriety you may have achieved. Step 5. In the “Education” Section, place the university you attended and the title of the degree earned. In addition, give specifics on the nursing license you possess. Make sure to include the name of the issuing entity.